I am outraged by a recent court decision that ruled that a Northern California High School acted appropriately when it ordered students to wear their shirts inside out. The shirts in question sported the American Flag and the school officials were concerned that the display of the flag would incite violence between American and Mexican Students. This concern of violence was during a Cinco De Mayo celebration being held at the school. Let me put this in perspective: American students at an American school were forbidden to display the American flag because it might inflame racial violence by Mexican students celebrating a Mexican holiday. How is this possible? How can an American court declare it is appropriate to forbid displaying the American Flag? But that is exactly what the 9th U.S. Circuit Court of Appeals said. The court said schools have wide latitude in curbing certain civil rights to ensure campus safety. “Our role is not to second-guess the decision to have a Cinco de Mayo celebration or the precautions put in place to avoid violence,” Judge M. Margaret McKeown wrote for the panel. The past events “made it reasonable for school officials to proceed as though the threat of a potentially violent disturbance was real,” she wrote. But the question to be answered is, did the school make the right decision? If the school was concerned about racial violence should they not have simply canceled the event? Would that have not solved the problem without trampling on the rights of others? After all, to celebrate Cinco De Mayo is simply that, a voluntary celebration. There is no guaranteed constitutional right to have a Cinco De Mayo celebration. The court mentions that the schools have wide latitude in curbing civil rights, does this latitude also extend to curbing constitutional rights? Can the court, charged with upholding the constitution, make a ruling that blatantly disregards the first amendment rights of the students who wished to display the flag? I wonder, what would have been the outcome if the courts had decided it was inappropriate for the Americans to fly the flag at the Alamo? Would the attacking Mexicans been less inclined towards violence and not massacred every last American defending the Alamo? No American should ever be denied the right to display the American flag in respectful manner. It is just that simple. To do so tramples on the graves of all Americans who gave their lives defending the flag. Every man and women killed in the line of duty are in a flagged draped coffin. Should we worry that may offend? Every American ship at sea flies Old Glory. Should we fear attack of those vessels because flying the flag may incense the sensibilities of other nations? I, for one, will stand up and insist on my right to display thee American Flag. If you are offended by this display of patriotism, then go away, or go to hell. Displaying the American Flag is not just symbolic. It represents all that we hold dear, including our basic constitutional rights. The United States government is doing all it can to overcome the 2nd and 4th Amendments, is the first next on their hit list? 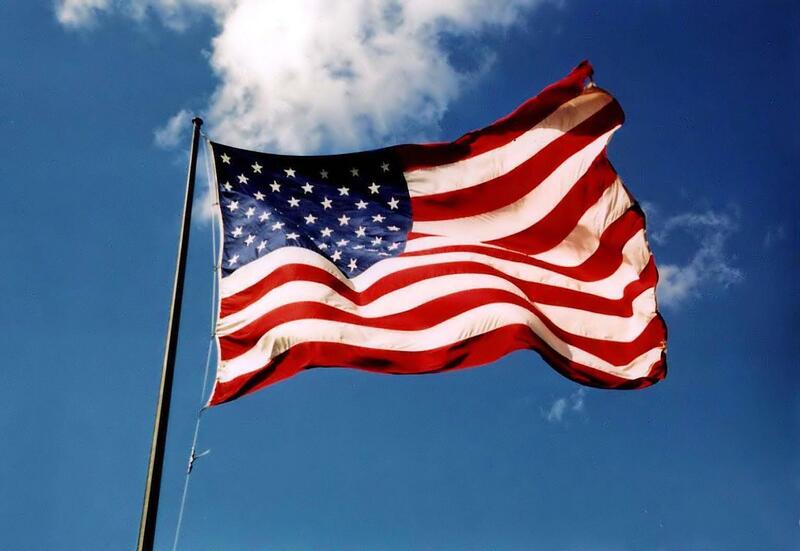 The American Flag is the symbol of this great nation. If you are offended by the American flag, then reside elsewhere. The U.S. Constitution is the guiding document of this great nation. If you are offended by the Constitution, then reside elsewhere. One of the wonderful things about this great nation are the freedoms we enjoy. One being the freedom to leave. Proudly may she forever wave, “O’er the land of the free and the home of the brave”. Feel free to comment, like, and share with others. I agree with you on this one Tom! I am also puzzled about why a Cinco De Mayo celebration would be inconsistent with the display of the American flag. It seems to be a celebration that lots of people celebrate kind of like St.Patrick’s Day.Whatever the racial tensions might have been “hiding” the American Flag was not the answer especially in America! Tom Lind I think there is a difference in wearing the flag as an article of clothing and displaying the flag on an article of clothing. The American Legion says “Unless an article of clothing is made from an actual United States flag, there is NO breach of flag etiquette whatsoever. People are simply expressing their patriotism and love of country by wearing an article of clothing that happens to be red, white, and blue with stars and stripes. There is nothing illegal about the wearing or use of these items.” Based on this, I think it was appropriate for them to display the flag on their shirts.